question_answer1) Which among the following is the fastest means of communication? question_answer2) DIRECTION: Study the givers map of Ruhi?s locality and answer the questions 2 and 3. 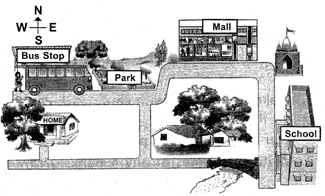 What is located south of the bus stop? question_answer3) In which direction Ruhi's school is located? question_answer4) Which of the following is run by man power? question_answer5) DIRECTION: Refer to the given figures and answer the questions 5 and 6. (A) (B) (C) (D) Which is the fastest means of transport? question_answer6) Which of the above is commonly run by CNG? question_answer7) Which of the following means of communication cannot be found in the given word grid. question_answer8) Rearrange the jumbled words to find the name of a transport that hovers in the sky. question_answer9) Look at the given road sign carefully. What does this sign mean? 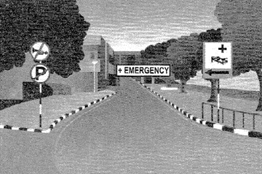 question_answer10) Which of the following signs will help a child to locate hospital? question_answer11) Rohan is standing facing the setting Sun in the evening. In front of him lies the _____ and behind him is the _____. Between them to the right side is ______ and to left side is ____. question_answer12) Riya is living in Chandigarh. Her friend Sanya is living in Japan. Which of the following is not a useful mode of communication between them? question_answer13) Select the odd one out on the basis of mode of communication. question_answer14) Which of the following is correct about the vehicle shown in the picture? question_answer15) Which of the following is not a common form of two-way communication? question_answer16) Which of the following vehicles is specially designed for disabled? question_answer17) Which of the following means of communication is best suitable for travelling a distance of 2 kilometre in rainy season? question_answer18) Which of the following means of communication is best suitable for travelling a distance of 2 kilometre in rainy season? question_answer20) In which of the following means of communication, there is digital transmission of the message? question_answer21) Which of these is used for mass communication? question_answer22) Which of the following is the least expensive means of transport? question_answer23) Which of the following is correct about the place shown in the picture? question_answer24) Study the given flow chart and select the correct option regarding P, Q, R and S.
question_answer25) The object shown in the picture is a means of ______ communication.